The Enciña da Lastra Natural Park is an anomaly among the vegetation Galicia has us accustomed to. It is started by its very name, which refers to the holm oak (Quercus ilex), a variety of tree unusual in these latitudes and more typical of the Mediterranean climate. However, here, in the northeastern edge of the Ourense province, it abounds due to the peculiarity of a climate warmer than average and a terrain characterized by calcareous rock. Enciña da Lastra is located in the Ourense municipality of Rubiá, belonging to the Valdeorras region and bordering with the Bierzo of León. Getting there is easy, because the park is crossed through by the N-120 road, which connects Ponferrada with Ourense. It is probably the driest place in Galicia, a place well known for precisely the abundant rainfall: here the average annual rainfall is 594 mm and the average temperature is around 13 degrees Celsius. These conditions make the area grow, in addition to holm oaks, scrub more typical of the Mediterranean climate, thyme, and even several species of orchids, that blend with the more common chestnuts, giving way to a variety in vegetation without equal in Galicia. The fact that the terrain is calcareous gives the landscape very distinctive ochre colours, and attracts birds of prey (golden eagles, peregrine falcons and even vultures), large colonies of bats that are attracted to the caves (palas, as they are known in the area) and the fluvial canyons that form around the Sil, the river that crosses the park, and also reptiles and amphibians difficult to find in other parts of Galicia. The Enciña da Lastra Natural Park is traversed by ten hiking routes that are a very interesting way to get to know the park and to visit several picturesque villages that retain all the beauty of old times. Oulego, O Robledo, O Porto, Biobra, Pardollán … are small towns hanging on the mountain slopes, in the shadow of huge calcareous formations that can be seen thanks to a wide network of viewpoints. 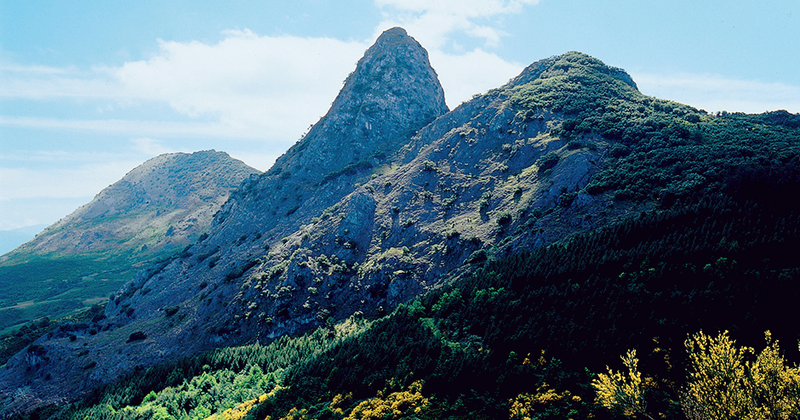 The imposing penedos (crags) of Oulego, that defy the sky with their ridged crests, and the Pena Falcoeira, discernible from most of the region, are probably the two best known elevations. Along many of the trails it is possible to observe, far in the distance, dominating the landscape and snow-covered through much of the year, the peak of Pena Trevinca, the highest point in the Autonomous Community. It is convenient to hike these routes with some kind of sun protection if you do it in the summer, because in the midday hours the heat becomes oppressive, and equipped with water to cool off. It is also highly advisable to keep the noise down, in order to observe some of the many animals that have, in this area, their only refuge in Galicia. To visit the caves it is necessary to enquire and obtain permission beforehand. The Pala da Zorra, with 600 meters of galleries and seven entryways; Pala Pumbeira, with an entrance by boat from the Penarrubia reservoir, and the Pala da Campá, with its unmistakable echo, are among Enciña da Lastra’s most popular grottos.